Put Medication In Carry-on Luggage - Can You Do That? You can and should carry medications in your carry-on bags! We get lots of questions about this. Can you take medications in your carry-on luggage? What are the rules for medication since you have to pack liquids you carry-on in a plastic bag? We've written a couple of pages on this subject.... and now you may be asking, how many different ways can we say it? Well, as many ways as it takes. We want everyone to understand this. NEVER check your pills and other medications. This packing tip is for you even if you're planning to check most of what you're taking. It's right up at the top of our carry-on tips. ...And your medications in that carry-on. If you're trying to travel with carry-on only... as we do... make sure you put your medications in the carry-on that you KNOW will stay with you. 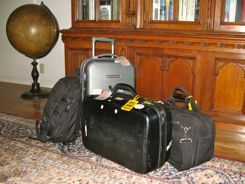 These days with all the fees to check luggage, more people are using carry-ons and the overhead bins in the planes often fill up. When that happens the airlines will require you to check your larger pieces at the gate. This is at no charge... but they're going as checked luggage. Put your medication in carry-on luggage that you know will fit under the seat in front of you. ...But with your meds in hand, at least you won't have to worry about replacing your medications. Of course your health always is, but you want to stay healthy for your trip, so put your medication in carry-on luggage... always. There, I think I've said that three times. Don't they tell you in advertising that you need to repeat your message three times? And I think we've written three pages on this subject too, so now if you follow this advice, you should never worry about losing those medications. Your medications do not need to go in that plastic bag you keep hearing about. 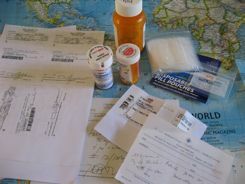 and Traveling With Pills will give you tips on how to carry those medications. If you need more help, just look around our site... we've probably got an answer for you. We have a sidebar on the right to help you navigate our travel health tips. Use our custom search... it will lead you to the pages that will help plan your trip, pack for it, and enjoy it once you're on the road. Once we've helped you with your research, pack your medication in carry-on luggage and have fun.